Product #16505 | SKU LMDA220 | 0.0 (no ratings yet) Thanks for your rating! 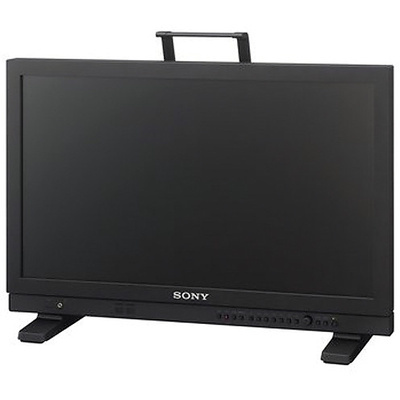 The Sony LMD-A220 22" LCD Production Monitor is a portable, 1920 x 1080 resolution monitor for on set, studio, and broadcast use. The monitor features an IPS LCD display with wide 178° horizontal and vertical viewing angles and provides 3G/HD/SD-SDI, HDMI, and composite inputs, which support NTSC/PAL, 720p, 1080i, and 1080p input signals with frames rates from 24p to 60p. The monitor introduces several new features and upgrades from previous LMD series monitors, including a new low latency automatic I/P conversion, new video processing engine for improved image accuracy, on screen tally, and yoke mounting screw holes. The monitor also provides a wide range of professional monitoring features, such as built-in waveform and vectorscope, focus assist with adjustable coloured peaking, time code display, and a Slog2 to Rec 709 LUT. A built-in audio decoder lets you display up to 16 channels of embedded SDI audio. Audio can be monitored using the 3.5mm headphone jack on the front panel, or with the 1W built-in speaker. A composite input with loop-out provides connectivity for standard-definition analogue devices and is paired with a 3.5mm stereo mini jack audio input. Two Ethernet ports provide connectivity for serial and parallel remotes; letting you control and load monitor settings via your network, as well as upgrade the monitor's software. For use in the field, there is a 12V DC power input on 4-pin XLR. The monitor is compatible with standard VESA 100 x 100mm mounting hardware. Optional rack mount brackets are also available. Monitor feet and a handle are included. Note: 1080/25PsF, 30PsF are displayed as 1080/25PsF, 30PsF on the screen if the payload ID is added to the video signal, or displayed as 1080/50i, 60i if the ID is not added.